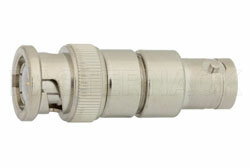 PE8216 is a coaxial RF DC block is from Pasternack and has an 50 Ohm impedance. Our 50 Ohm DC block is manufactured with a BNC input and BNC output. This BNC DC block is an inner direct current block type. 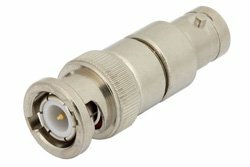 Pasternack inner BNC DC block is rated for a minimum frequency of 10 MHz and a maximum frequency of 4 GHz. PE8216 BNC inner DC block has a maximum insertion loss of 0.5 dB and a maximum VSWR of 1.35:1.